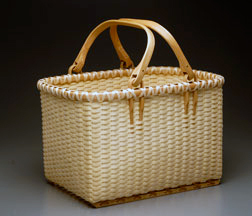 These tightly woven rectangular baskets come in many different sizes making them suitable for endless practical uses. Smaller baskets are perfect for odds and ends or letter storage while the larger ones hold a delicious picnic or an armload of vegetables fresh from the garden. 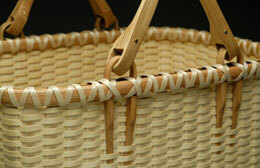 Double swing handles were traditionally used on these baskets to keep the contents from shifting while in use. “Ear” handles or single overhead handles are also available and popular. 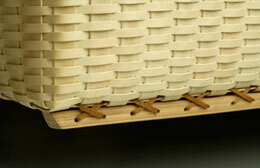 Large Picking Basket with carved white oak, double swing handle. Large Picking Basket with handcarved runners attached with elm bark. *Sizes are approximate and do not include height of handle.